Kanga Organics, is now testing JungleVine™ fabric as an organic skin conditioner! Our new Nature Bag volunteer Vandara has brought us exciting news that the fabric of the Earth’s Greenest Bag has been used in areas of northern Japan to make aging skin young, blemished skin smooth & dry skin naturally moist. Vandara uses the miraculous ancient fabric regularly, and her skin is as beautiful as we’ve seen. Several other volunteers are experimenting to see what results they experience. Its use can be as simple as rubbing it against the skin for a few minutes daily. Kindly share with us what you experience by stimulating your skin with your green reusable tote. If you would like to try the cloth sans the carrying capabilities, email: Vivian(at)NatureBag.ORG with a postal mailing address, and we’ll send you a free sample. 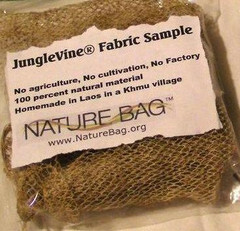 Or go to http://www.naturebag.org/products/junglevine-fabric#.T_uK__XW-3N and order as many packets as you like for only US$1.00 each plus US$4.00 S&H. We have 1 free sample to giveaway to the next customer who orders SGD$200 above worth of products from Kanga Organics, so act fast, and grab your JungleVine™ fabric organic skin conditioner with your online green shopping today! Nature Bags are now on sale too!